Firstly, let’s all congratulate Jayne Joy for being picked to represent Cheshire in the upcoming Inter-county Fell Race at Witton Park on 18th May 2014. More details below, be sure to click on the Inter-counties tab. Saturday 3rd May 2014 was the 60th Delamere Park Run and we had two PB’s for Helsby, firstly with Colin Bishop in first overall in a superb 17.38 and with Claire Morton in 134th in 27.35. Louise McEveley was first Helsby lady home. The Halewood 5k saw Ivan Davies secure a course PB as well as Tom DeJong securing 1st in his u20 age category and knocking a big chunk off his previous best to finish 22nd in 19.25. Great result for Tom after his recent first time under 20 minutes and this race highlighted Ivan’s improving form. 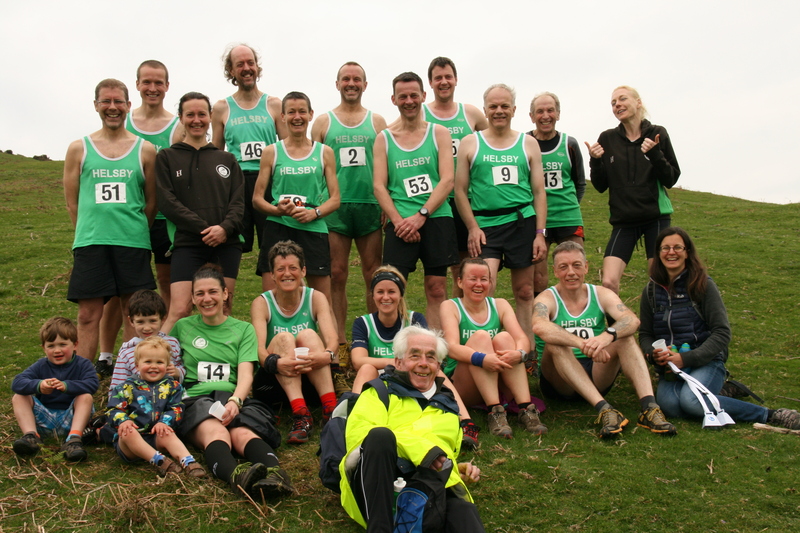 It was the Llangynhafal Loop Fell Race on Saturday afternoon which was also a club fell counter and a fantastic turn-out for Helsby saw 18 green vests out in the field of 82 in total. Impressive performances all round saw Jim O’Hara first senior male home with Jayne 1st lady overall. Other notable prize winners on the day were Janet, Mario and Alec but some wonderful and exciting performances all round, especially the Phil Gillard and Dave Feakes downhill race-off! Well done also to Lizzie who chose quite a difficult first fell race. Rumours are Mario is still locked away playing with his prize…………you’ll have to ask him when you see him. Special congratulations to Jackie who not only ran the Loop but then didn’t stop and continued to Abergele. Awesome! Thanks to Joe out on the course cheering and marshalling and to the brilliant cheers from Laura and her support choir consisting of Charlie, James and Rhys. 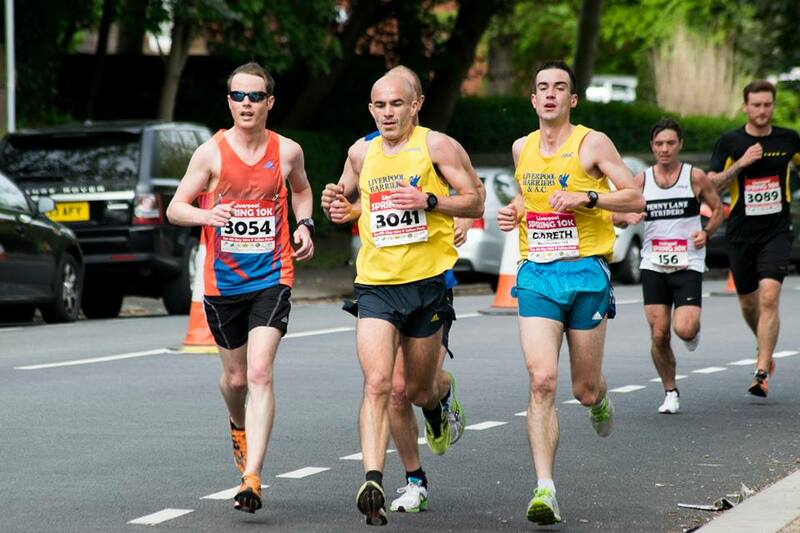 Sunday was the Liverpool Spring 10k at Sefton Park where Colin Thompson and new recruit Gaz were the Helsby representatives. Colin kept up his good form with a great time of 35.21 nudging him ever nearing to the sub 35 he is more than capable of Gaz had a brilliant sub 40 PB as well. Well done! In a rather pleasant day off work Helsby’s Jayne Joy headed to Glossop for the James Thorn Fell Race. With someone removing all the flags from what was the night before a flagged course many people ended up running off course or adding extra miles including race leader Andi Jones who remarkably still ended up 2nd after a long detour. No results as yet but Jayne achieved a 2nd place finish so another podium in the bag. It’s also worth noting that Ex Helsby fell runner Danny Chan was a brilliant 3rd in this event and is now running for Pennine. If you are reading Danny, good to see you and keep up the great achievements on the fells. If I’ve missed any events please let me know and I’ll update the blog but if you do want to be in the round-up then it’s always good to let me know. As mentioned in a previous email, Dinas Bran on Wednesday, be good to have a good Helsby turnout as I’ll hopefully be there with the camera. Lads, a bit of make-up wouldn’t go amiss, the girls look great. Adrian has asked if anyone would like their names on their Helsby Hoody. It costs about £3 for a full name. Please see Adrian on a Wednesday to arrange.